Dysfunctions on an iPhone occur in many ways that a newbie would find it hard to comprehend, especially if it is your first time using the smartphone. For instance, your iPhone can suddenly go off and refuse to start. What would you do? A black screen is a common problem that most iPhone users encounter from time to time. Like any other iPhone display problem, black screen can be as a result of software or hardware issues. Some of the problems related to black screen include a drained battery, hardware faults, crashed application and so on. When fixing an iPhone stuck on black screen it's hard to tell which problem shouts out from all the rest. However, there are a few solutions that have proven to be more resourceful when dealing with iPhone stuck on black screen problem. Let's have a look at them. The first and crucial method is to try to restart your iPhone when it is in a black screen. This is one way to take care of all the software resets within the system. One advantage of this method is that your data will not be affected during the process. So how will you do it? It's quite easy. On iPhone 6s or earlier devices, press and hold Power and Home button simultaneously for 10 seconds or more until you see the Apple logo. On iPhone 7/7 Plus models, press and hold Power and Volume Down button at the same time for about 10 seconds until you see the Apple logo. 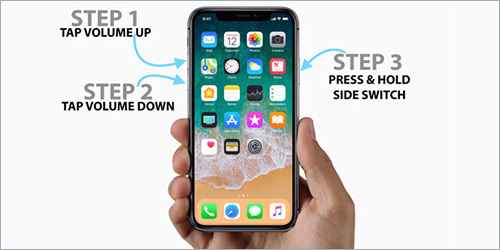 On iPhone 8/8 Plus, X and latest devices, press the Volume Up Button and quickly release your finger from it; then press the Volume Down Button and quickly release your finger from it; Now press and hold the Power button until the Apple logo appears. At times people use their phone to battery exhaustion. This leads to a black screen as well. To know whether your phone is having this problem, you will have to connect it to a charger to charge your battery. Step 3: Once the iPhone is fully charged you can try to start it. If the iPhone is in a good condition, it should start immediately. But if it cannot start then you will have to take another solution. 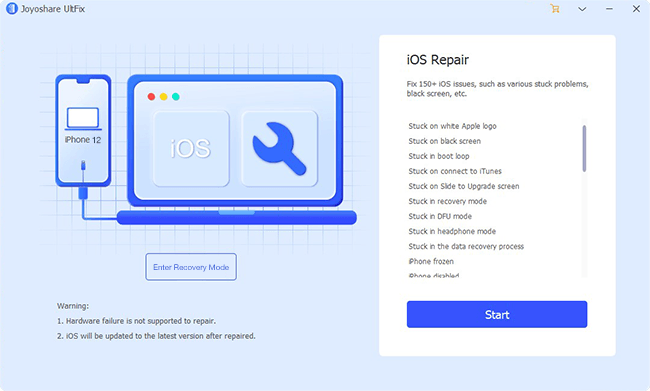 One of the most promising methods of fixing iPhone stuck on black screen of death is using an iOS system recovery tool. 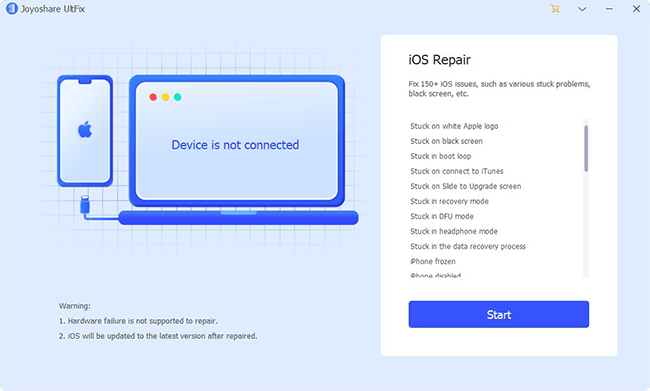 Joyoshare UltFix is one recovery tool proven to work efficiently when dealing with the black screen, white screen, blue screen, iPhone stuck in recovery mode and unresponsive iPhone. One advantage of using this method is that all your data remains intact. The application is available for both registered and unregistered users all over the world. It comes with two modes. The standard model helps in fixing common problems used to fix iPhone stuck on white Apple logo, black screen and so on and the Advanced Mode to resolve where the standard model has failed. The following is step-by-step guide to fix iPhone black screen of death problem with Joyoshare UltFix. Open the Joyoshare UltFix iOS System Recovery software (Downloaded from Joyoshare's main website). Connect the Black screen iPhone to the PC using a USB cable that comes with the iPhone. 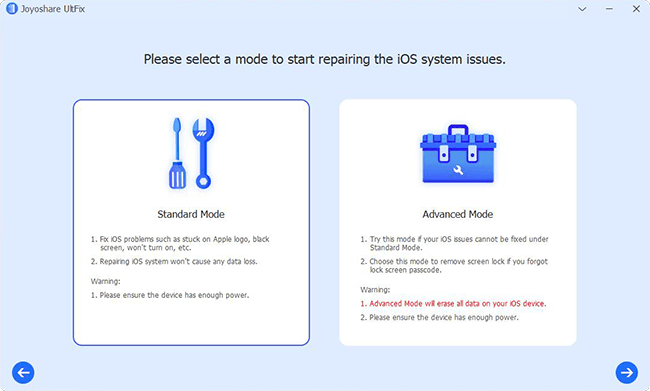 Enable iPhone recovery mode such as Standard Mode, follow the instructions provided by the program in this step. Put your iPhone into the DFU mode or recovery mode. You can also one click to enter the recovery mode in the first interface. Download the firmware, the application should be able to detect the iOS version on your device. If it can't, you can do it manually. 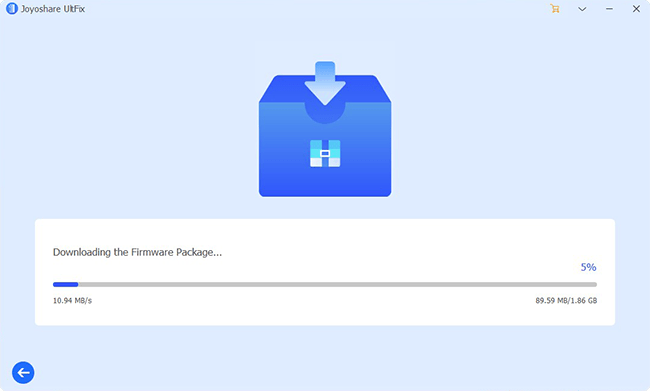 Then click the Download button to download and verify the firmare package. Next step is to repair the black screen iPhone by clicking the "Repair" button at the lower right corner. When it finishes, check your iPhone and see whether it can work normally. If not, try it again or switch to the "Advanced Mode". 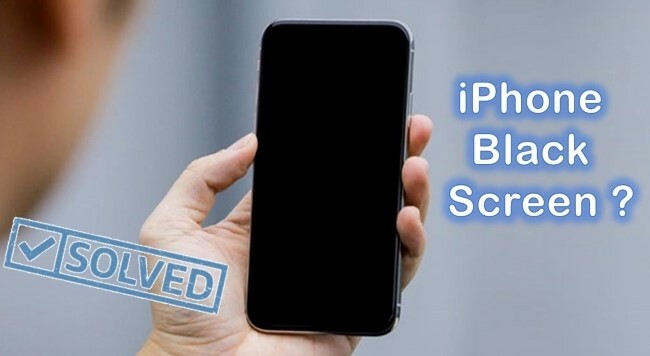 This could be another method to fix iPhone stuck on black screen issue, but the only problem is that you stand to lose all the data on the iOS device. Step 3: Click the "Restore" button and it will automatically erase all the data. But if you have an iTunes back up you can save all your data there; Once the process is complete, your iPhone should be back to normal. Note: iTunes does not work properly for all iPhone users, some iPhone will exhibit problems when using this method. If you have followed the solutions above correctly, your iPhone should be out of the black screen of death by now. If you have tried the methods above and nothing seems to work, there are some hardware problems that if you try to fix will only result in damaging the iPhone. If it's hard for you to follow through you can always head to the professionals. There are many problems related to a black screen, the big question is, have you tried the methods above for comfort? If not then it's about time you did. When your iPhone has a minor problem, you can correct it by yourself and save you the cost of phone repair which can be hard on a tight budget before taking it to a professional. 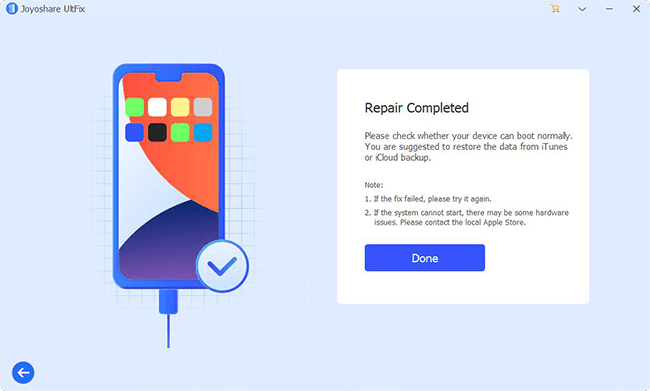 We highly recommend you to try Joyoshare UltFix iOS System Recovery because it can fix up to 30+ iOS problems without data loss including the black screen of death on your iPhone.